and Holyoke areas of Massachusetts. The success of your Bat Bungalow depends on a number of factors, including the exterior color and sunlight exposure. Full, all-day sun is often successful in all but the hottest climates, and houses should be mounted at least 12 feet above ground. Our Bat Bungalows are designed to maximize your success in attracting bats, and bats are nature's most efficient way of eliminating mosquitoes and other bugs! We use specifications recommended by Bat Conservation International, and quality building materials, such as exterior grade (not pressure treated) 1/2" 4/5 ply BCX plywood. The inside panels are hand-routered and stained, making for an easy climb into the chamber, rather than painted, as the paint fills the grooves created by the router. We do not use any materials, such as screens or plastic mesh, that will deteriorate over time. All connecting surfaces are sealed tight with caulking and then screwed together. Each Bat Bungalow is individually handcrafted in the USA. Call for free shipping in the Springfield, Chicopee and Holyoke areas of Massachusetts. Shipping within the continental U.S. only. The region in which you live will determine the exterior color of your Bat Bungalow. Region 1: black suede. Region 2: amber leaf. Region 3: canoe. Region 4: toasted marshmallow. small bat bungalow: 10 lbs, 17" x 27" x 2.5"
large bat bungalow: 13.5 lbs, 25" x 27" x 2.5"
3-chambered bat bungalow: 19.5 lbs, 19" x 31" x 5"
4-chambered bat bungalow: 22.5 lbs, 19" x 31" x 6"
The screws are countersunk and filled with wood filler so there are no visible screws, giving the house a clean, finished look. Outer surfaces are primed and then painted using two coats of exterior grade, water-based flat paint. We provide four colors to choose from, maximizing temperature efficiency and attracting bats with the goal of keeping them comfortable, whether they migrate or roost year-round. For more information on helping to make your Bat Bungalow a success, please visit: Criteria for Successful Bat Houses. We can leave the flat exterior surfaces of your Bat Bungalow unfinished for you to paint or stain. The interior surfaces and routered landing pad extending from the base will be stained as seen here. Or we'll paint the house for you. Just click on the drop down menu and choose your region's color from map below. 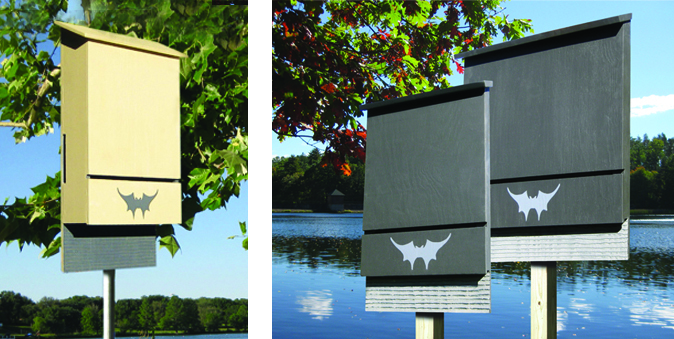 With mosquitoes swarming and concerns of Zika and West Nile Virus on the rise, the popularity of bat houses is also on the rise. Read the full article by clicking here. Learn how to install your bat house on a wooden post: Click here to watch our DIY video on YouTube. Requests to cancel orders that have been processed are subject to a 15% restocking fee. For orders that have shipped, a 20% restocking fee plus shipment costs will be charged. No refunds will be given after 30 days of purchaser receipt. Items damaged during return shipment may not be refunded. Shipping insurance recommended for declared value of item. Return shipping costs will not be refunded. When ordering more than one of any of our models, please call us so we can calculate the correct shipping amount: (413) 330-1798.